I am an artist drawn to the beauty but also to the potential in the world around me. I see in the mundane the vision of what could become. I use my craft to capture the beauty of nature by transforming base material into art. Nowhere is this transformation more apparent than in the translucence, fluidity, and elemental nature of glass. While the interplay of color and light in the glass appeals to my artistic eye, it is the texture, movement and interplay of these colors and textures that informs my artwork. In this way, I bring my visions into the three-dimensional space of the viewer. While I mainly work with the media of glass, I am also a mosaic and fiber artist. 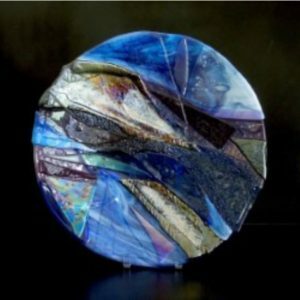 My glass art borrows heavily from my early foundation in fiber art; particularly with a woven technique that allows glass to simulate the texture and draping of textiles. How the same subject also inspires me can be seen in so many ways and how our collective diversity creates a more interesting and inspired story. In this way, my art is both deeply personal and an act of connecting with others. 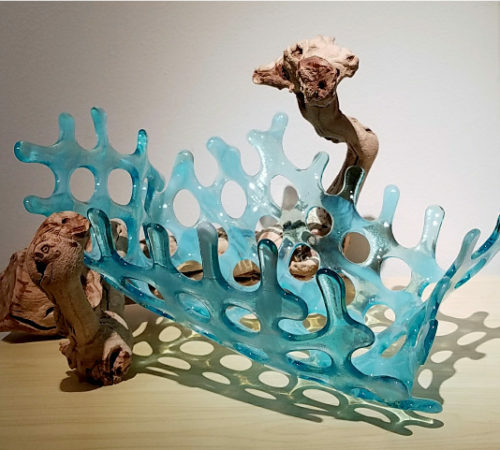 Denise is an award-winning glass artist and recipient of the Community Foundation for Northeast Florida Art Ventures Grant. She currently resides and works on Amelia Island, Florida. The inspiration for much of my work is taken from the natural beauty of Amelia Island and Northeast Florida. We are surrounded by beautiful beaches, marshes and forests and I count myself fortunate to be able to translate and express that beauty into glass. 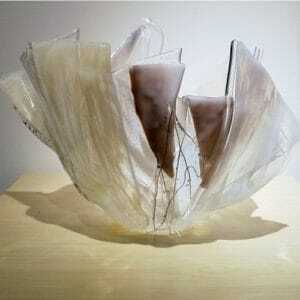 My work is created through the medium of kiln formed glass (also known as fused glass). This is actually one of the oldest methods of working with glass, as some historians say it dates back to the time of the Ancient Egyptians. However, the first definitive evidence of glass fusing can be traced back to the Romans, who used this technique before the discovery of glass blowing. It is called kiln formed because the glass is melted and shaped in a kiln. As suggested by the name, sheets of glass are cut, combined and melted in a kiln gaining its shape by using molds. 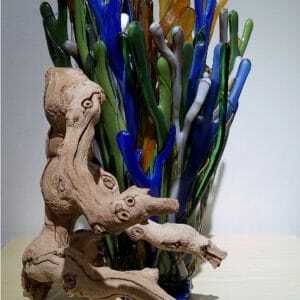 The same principles are used in glass art as with other forms of art – some basics of art fundamentals – the elements and principal of good composition, design and color. But, additionally, you need to know the technical side – that is the science. 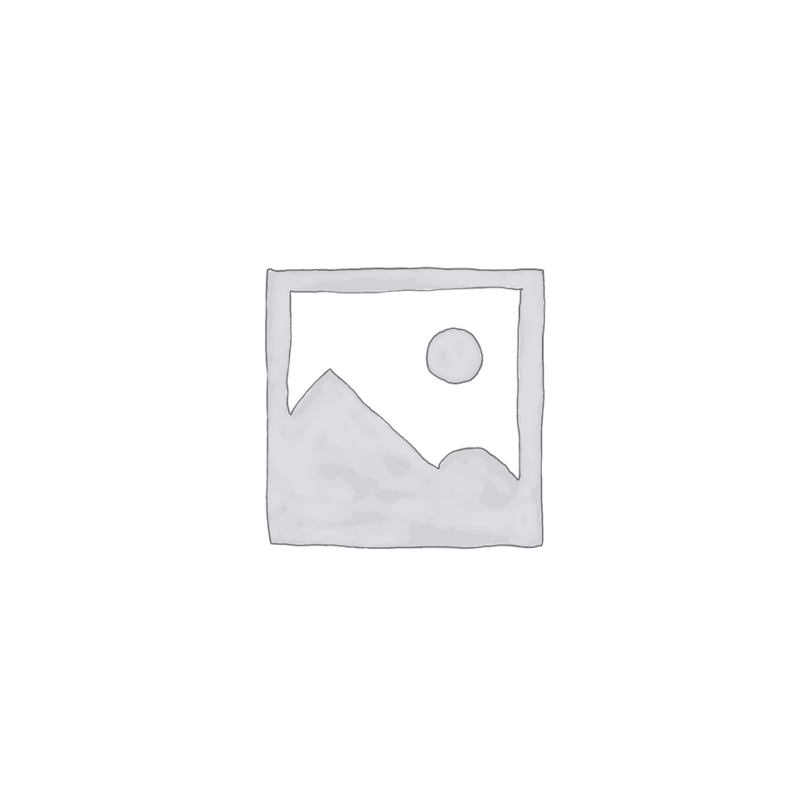 COE or coefficiancy of expansion the rate at which glass expands and contracts. If you combine glass with a different COE you will create thermal shock and the glass will shatter. Other ways that can cause thermal shock are: The rate that you raise the temperature in the kiln, the rate that you lower the temperature in the kiln, how long you anneal a piece (holding at a temperature to remove strain and make glass less brittle). You should be aware of the glass chemistry to know reactive qualities. Glass is made up of different elements to help create its color. Some glass has sulfur, others copper, lead, gold. Experimentation is an important factor to keep growing as an artist. Failures are expensive! The glass I use comes in many forms: powder, frit (glass chunks), stringers (thin spaghetti-like), and in sheets (like stained glass). Powders can be used to create paint-like qualities in the glass as well as a crackle technique developed by Bob Leatherbarrow. I often use frit and stringers in my work to add definition and design, particularly in my more abstract pieces. Sheets of glass are used most often to create the base of a piece as well as design elements. A typical fusing process requires the glass to be heated to about 1475 degree fahrenheit. In order to avoid thermal stress, the heating and cooling rates must be set according to the thickness of the glass. A large bowl that is maybe three layers thick may require a rate as low as 100 degrees fahrenheit per hour. That means that the average fusing cycle of this bowl could be about 20 hours or longer. Additional pieces of glass may be to added to the piece to create the desired design and fired at a lower temperature known as tac fusing. This process adds dimension to the piece. The last component will be to slump or drape the piece into or onto a mold to create it’s final shape. This is done at a lower temperature. If I want a matte finish, I will sandblast the piece. Sometimes edges need to be ground with diamond pads. This is known as cold working the piece. My grass pieces are typically made by cutting strips of sheet glass and arranging them on the kiln shelf in the pattern of grass. I melt these pieces at a very high temperature. I remove this completed base structure known as a blank and then fill the kiln with smaller individual grass-like pieces. I fire these at a very high temperature. After I have created these components, I then place into the kiln the original base (or blank) and add the components to the top of the base and tac fuse at a lower temperature to create a three dimensional effect. Lastly, I will drape this blank over a cylindrical form and fire at an even lower temperature to created the vessel shape. 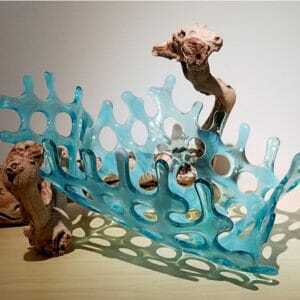 Sea Fan pieces are made by firing an actual sea fan onto the base glass. 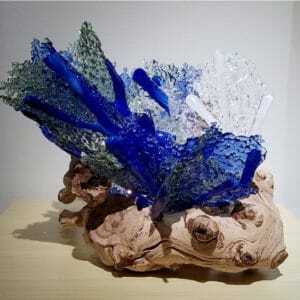 I sprinkle glass powder over the sea fan and place the base glass over the powdered sea fan and fire. The sea fan will turn to ash and the “ghost” image will remain on the glass. I cut an iridescent sheet of glass to cap the image and full fuse. I then add mosaic designs on top of the first layer of glass and fuse at a lower temperature, creating a three dimensional effect. The piece is now 3 layers thick. Lastly, I drape the completed blank over an upside down bowl-like form to create it’s final shape. In all, the piece has visited the kiln 4 times. Abstract pieces are cut and shaped and visit the kiln several times to generate a multi layered three dimensional quality. Often I will add powders and mica to create a shimmering quality to the piece. Color, texture and the juxtaposition of light is what makes glass art so compelling and alluring for me. It appeals to my creative urges, and calls me to the kiln for that next new exciting work that will emerge.